I recently read a newspaper article about Justin Bieber and the problems he is allegedly creating for his homeowners association in Calabasas, California. Homeowners are apparently unhappy that he is racing his Ferrari around the association’s streets, and they threatened to withhold payment of their assessments unless and until their board did something about the situation. That would be a mistake for those owners or any owner who has a dispute with their association, because they simply do not have the right to withhold payment of their assessments as leverage to get their association to do what they want. Owners often make this threat. Usually, it is when they have suffered damage in their unit, or they want maintenance done and they think that the association has not responded as quickly or as well as they would like, or with the answers they want. These owners think they are tenants, and the association is their landlord, and that gives them the right to withhold the only income the association receives to pay for maintenance, utilities, insurance, management-and the list goes on. That belief is wrong and has gotten some owners into trouble. This issue was addressed and decided by the California Court of Appeal in the 1994 case of Park Place Homeowners Association, Inc. v. Naber. That case held that under California law, an owner’s obligation to pay assessments is not subject to offset. The court in Naber acknowledged that homeowner associations rely on the assessments to pay the bills and would cease to exist without the regular payment of assessment fees by their members. The court in Naber made a very important distinction: the covenant to pay assessments is separate from the covenant to maintain the common area. The performance of the association’s duties is not consideration for the payment of the owner’s assessments. The California legislature has long recognized the need for community associations to levy and collect assessments from the owners. Since the Davis-Stirling Act became law in 1986, the Civil Code has included procedures for associations to quickly and efficiently seek relief against delinquent homeowners by permitting the recordation of assessment liens and collection by way of non-judicial foreclosure. The Court in the Park Place v. Naber case acknowledged that permitting an owner to assert an alleged failure of their homeowner’s association to enforce the rules or properly maintain the association as a defense or offset to an enforcement or collection action would “seriously undermine” those rules and procedures. However, that does not mean that owners are left without remedies if their association does not enforce or comply with the CC&Rs, and they feel they have suffered damage as a result. In California, an owner has two options. One is the option recognized by the court in Naber. If the owner’s problem(s) with the association are serious enough, the owner can (as they so often do) file legal action against their association. The other option, pursuant to California Civil Code Section 5658, is for the owner to go to small claims court. If an owner disagrees with the amount of an assessment, fine, penalty, late fee, collection cost, or monetary penalty imposed as a disciplinary measure, and the amount in dispute is within the jurisdictional limit of the small claims court (for owners that is now $10,000), the owner may, in addition to pursuing dispute resolution (IDR or ADR), pay the disputed amount and all other amounts levied under protest and commence an action in the small claims court. This procedure allows the association to meet its financial obligations by allowing for the regular payment of assessments, and still allows an owner to avoid the possibility that they will lose their unit or home through foreclosure to their association as a result of failing to pay their assessments. This procedure gives the aggrieved owner some protection to address their grievances with their association, and if that does not resolve the situation, they can take the dispute to a small claims court judge. While owners have this option, we very rarely see an owner utilize the “payment under protest” process. 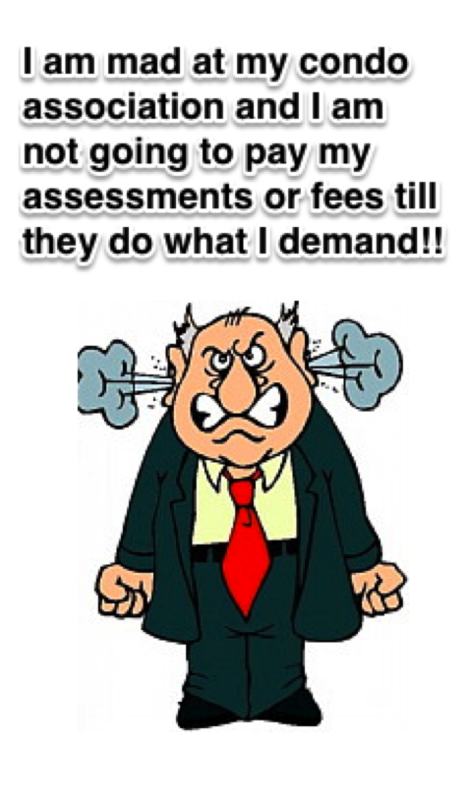 Either they have a legitimate beef with their association and know that they have to pay their assessments while pursuing legal action or, as is most often the case, they mistakenly assert a right to offset as an excuse to avoid paying their assessments. So, if one of your owners has claimed that they do not have to pay their assessments or fees as an offset to some damage they claim they suffered, refer them to the Park Place case. That is what we do!